Valenti Angelo (1897-1982) was an Italian-American printmaker, illustrator and author, born June 23, 1897 in Massarosa, Italy. He immigrated to the United States with his family in 1905, living first in New York City then settling in Antioch, California. At the age of nineteen, Angelo moved to San Francisco, working by day as a labourer and spending his evenings and weekends at libraries and museums. 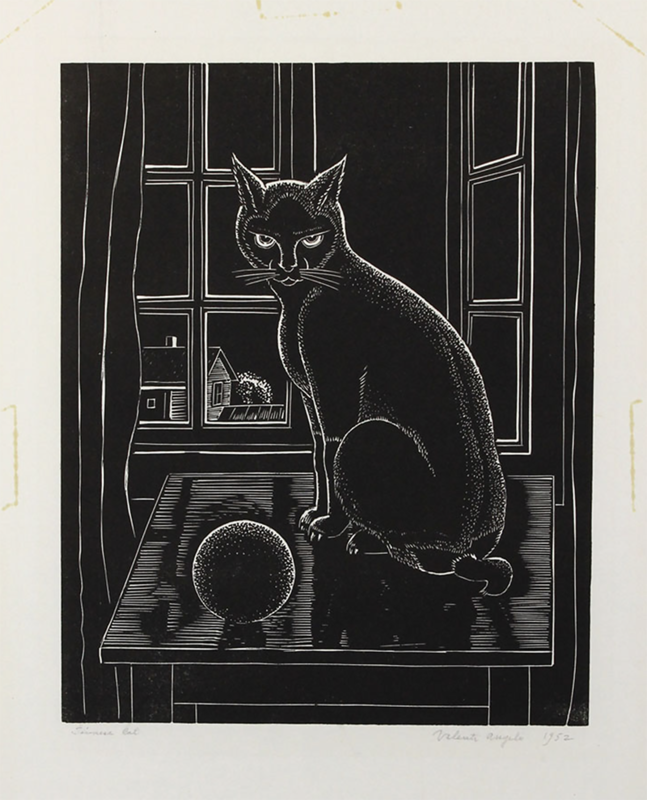 He soon became a versatile artist and an especially skilled engraver and printer. Angelo’s favoured medium was the linocut, and his prints depicting urban nocturnes and desert scenes of the American Southwest are particularly coveted by collectors and dealers. In 1926, Angelo made his first book illustrations for the well-known, San Francisco-based Grabhorn Press. In a period of 34 years, Angelo decorated and illustrated roughly 250 books. Among these were folio editions of Walt Whitman’s Leaves of Grass, The Travels of Sir John Mandeville, and numerous books of the Bible. Many of these books have been included in the annual American Institute of Graphic Arts exhibitions since 1927. Under the tutelage of May Massee of Viking Press, Angelo began writing children’s stories in 1937. In 1939, Angelo won the Newbery Honor for Nino. After a mid-life relocation to New York State, he returned to San Francisco in 1974 and continued his life’s work. Angelo died in San Francisco on September 3, 1982. Block print on cream laid paper. Utterly beautiful and a supreme work. Signed, titled and dated by the artist in pencil just below plate mark. Provenance: Collection of the late Marianne C. Gourary.